The quest for the perfect restaurant brings a creative couple into their own Morehead City home. As he sprinkles a fresh piece of fish with an enticing blend of spices, Baptist Knaven whistles a lively tune. 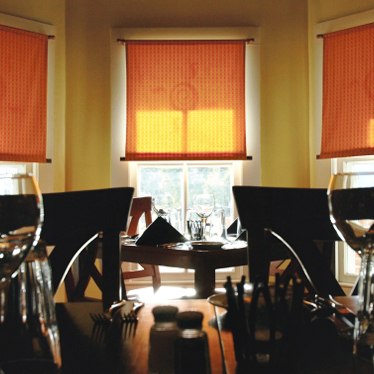 As the sun sinks, customers begin to file into Café Zito, the Morehead City restaurant Knaven and his wife, Jenn Kelley, opened in 2005, so it’s hard to pick out Knaven’s song above the din of clinking wine glasses, conversation and laughter. It could be anything; rest assured the iTunes library in Knaven’s head is stocked with a broad musical assortment. Kelley gave up a career as a professional ballet dancer to return to her homeland and start the business. Now the two artists put on a different kind of show every night, surrounded by the bright but warm colors on the century-old walls in the historic Bell-Phillips House on South 11th Street. Their creative urges are still satisfied. The road to their return to “entertaining” was long and arduous. After 13 years of pursuing their artistic endeavors together in Amsterdam, Knaven and Kelley sold virtually everything they had to buy the house in Morehead City — which was a sandwich shop a few years ago — sight unseen. Knaven, who was trained musically at the Royal Conservatory in The Hague, comes from a family of musicians. He made a career out of it while maintaining a strong passion for cooking. In the travels that come along with an artist’s lifestyle (they met while Kelley was performing with the Dutch National Ballet in Amsterdam; Knaven was in the orchestra), the couple stayed in constant pursuit of the perfect restaurant. The search evolved into the dream of someday having their own. “Fairly soon after we got together, we said, ‘In 10 years, we should have our own restaurant,’ ” Knaven recalls, his endearing Dutch accent the only hint that his English is anything short of impeccable. 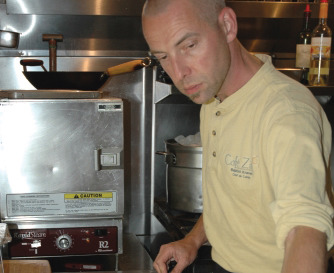 Just shy of 10 years later, in February 2005, Cafe Zito opened its doors. As the idea of giving up their careers and opening a restaurant slowly became a bona fide goal, the implementation of the plan became more imminent in the early 2000s. Kelley, who grew up in Maryland, vacationed with her family in the Crystal Coast area as a child, and her parents had relocated permanently to Morehead City. She and Knaven visited every summer from Amsterdam, and they began scouting spots to open the business, searching, ideally, for an older house in a nice neighborhood. Knaven had already begun working in the restaurant business, cooking part-time for a while before going full-time as a restaurant manager with Ikea, the Scandinavian furniture chain that is ubiquitous in Europe. When their daughter Uma was born in 2000, Kelley stopped dancing and began taking management courses. They were just about ready to make the leap. A few weeks after one summer trip to Morehead City, Kelley’s parents called her and said, “You’ve got to see this house,” which, of course, was an issue since she was 4,000 miles away. Herfather, an architect, examined the oldBell-Phillips House and, on his advice,they bought it and moved to the U.S.
For the next two years, Knaven worked at a restaurant in town and Kelley taught ballet full-time while both — with the help of her parents and friend Greg Tuomi, who’s now a waiter at the restaurant — chipped away at turning the dilapidated house into a world-class restaurant. The kitchen was gutted and approximately doubled in size. The black hardwood floor was sanded to reveal a lustrous 100-year-old pine. After a mountain of other structural work, the walls were painted in a pleasing, subtle combination of orange and yellow and adorned with photos Tuomi took of items excavated from the house during the renovation. The downstairs fireplace, a focal point of the house, was painted a resplendent burnt orange. The work before the restaurant opened on Valentine’s Day 2005 made running the business seem like a piece of cake. “People often told us, ‘You guys are crazy that you’re opening a restaurant. It’s day and night.’ ” Knaven says with a smile. Knaven, a solid, slender 40, often speaks with an impish grin that escapes from above the soul patch on his lower lip. He maneuvers quickly through the restaurant as he retrieves supplies and ingredients from the back and turns them into masterpieces out front. He’s been all over the world, a fact that somehow comes across in his demeanor. In addition to English and his native Dutch, Knaven is fluent in German and conversational in French, Swedish and Croatian from his stints in those countries. The way he figures it, he’s done all the traveling so his customers don’t have to. “It’s fun to introduce people to new things, different things,” he says. “We let them go to the Mediterranean without having to get on an airplane. I believe we are succeeding in that.” Given his background, it’s not surprising that Knaven always seems to have a tune in his head, and it emerges in the form of a sportive whistle as he prepares his Mediterranean specialties with local ingredients. 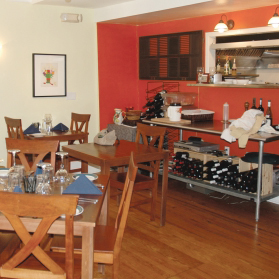 Through relationships established with suppliers, Café Zito’s menu has become mostly organic. But that, Knaven says, is almost coincidental. “We don’t really promote organic food,” he says earnestly. “We promote good food. We promote local food, as long as it’s good.” His specialty, Knaven announces quickly when asked, is “fish, fish, fish and more fish.” The variety is determined by his supplier, who brings in a new catch a few times a week. Recently, the supplier surprised him with a haul of 2-pound red snapper, which became an immediate hit when Knaven, ever the showman, filleted them at the customers’ tables after they were cooked. If Knaven and Kelley seem right at home in the restaurant, it’s because they are. While the downstairs serves as a place of business, the upstairs area is where they live. “It’s very manageable,” Knaven says of the 38-seat restaurant. “It’s very quaint. It’s our living room, basically.” Quite logically, Knaven compares operating the restaurant to throwing a dinner party every night—only you don’t know who’s coming, how many are coming or what they’ll want to eat. The more, though, the merrier. Well, sort of. Knaven’s double bass took him all over the world to play venues both large and small — but never weddings or parties, the mere suggestion of which seems insulting to a musician of his pedigree. (“That wasn’t my scene,” he says, trying to disguise a slight scowl.) He recalls playing chamber music in intimate halls as well as orchestral performances in 14,000- seat hockey arenas. Kelley danced, among countless other places, at London’s Royal Opera House and the New York State Theater. When Uma came along, she said, it changed her perspective. Rather than have someone else raise her daughter while she worked 10 hours a day, six days a week as a dancer, she decided to make a change at age 30. Still, she says, she misses “a tiny part” of ballet. “I miss the fulfillment of performing something really challenging, really inspiring,” says Kelley, 35, whose supershort blondish hair conspires with glowing eyes to give her a uniquely elegant look. Knaven looks back on his musical career with mixed emotions, but regret is not in the mix. “Missing it is too big a word,” he says. “If I missed it I would still do it, I guess. I love what I’m doing now. I sleep much better at night, although I sleep less hours. I wake up with a better feeling and I go to bed with a better feeling, so somewhere in my day I must get more fulfillment than I used to.” It could be that Knaven’s job now is not that different from what he did in Amsterdam and around the world with a double bass. And it could be that it’s not that different from what Kelley did on the stage, either. There was, after all, a huge leap involved. The couple’s lifelong search for the ideal restaurant hasn’t ended; it evolves every day, right in their living room as they try to improve each customer’s dining experience. It must be working. Last year for their 13th anniversary,Knaven and Kelley made dinner plans at another restaurant.When they ordered a bottle of wine that night, the bottle came with a well-wishing note from an attentive Cafe Zito customer. “You realize that people are very generous,” Knaven says, “and they’re honestly supportive.” The customers who have discovered the restaurant are supporting the pursuit of what Knaven and Kelley have sought for years — their perfect restaurant. Technically, Knaven points out, the name of the restaurant is pronounced “Cafe zee-TOE.” In Greek, the word means “looking for” or “searching.” But Knaven and Kelley don’t mind if you pronounceit the more conventional way, even though it’s a totally different word. It may, in fact, be more fitting.